iOS 12, which is set to debut this fall, is a major overhaul for iPhone and iPad. Since CarPlay is just a projection of your iPhone's display, it makes sense that we'd see at least a few notable changes. One of the first things we tested out was the new Maps application. Apple is replacing all the mapping data with their own in-house data instead of relying on third parties. Maps is now much more detailed than it has been in the past but is limited at the moment. This new mapping data is rolling out first in the Bay Area, before spreading to the rest of California and then the rest of the US. For those who don't prefer Apple Maps, they can rejoice because third-party map and navigation apps can now be used with iOS 12, including popular options like Waze and Google Maps. They work seamlessly and offer unique features not found in Apple's own Maps app. Many developers have already voiced support, including some with offline mapping capabilities. We also saw a few performance improvements this year to audio apps. They have much-improved performance, with smoother animations and significantly quicker startup times. In our testing, we saw this across the board with any audio app, even ones that have yet to be updated. We didn't get all the updates we were hoping for, but it seems next year we may be more lucky. In the meantime, faster and more reliable audio apps plus an improved Maps app and third-party mapping applications will surely be welcomed. I’ve all but stopped using it in my 2018 Audi. Granted, a large piece of it is Audi’s half-hearted implementation of it, but that, again, is the kind of thing Apple should be able to negotiate better, given its size and scope. Hi, I've got iOS beta 12, and I can't use Google Maps, TomTom or Wase, how did you manage to get them on CarPlay?? "Now, if only automakers would make their own apps to go with CarPlay..."
Unless they changed something, I found CarPlay to be much better than the Nav system in my 2017 A4. I like the dashboard integration that it has, but the Audi voice recognition system is atrocious. It would routinely refer me to destinations 2 states over. I agree that using a click wheel instead of a touch screen was kind of moronic, though. As for Sirius, I don't see why they couldn't make an app, but I found Sirius dreadfully overpriced and dumped it as soon as the 6 month trial period was over. I just recently upgraded my 2009 RAV4 with a Sony XAV-AX100 and I have to say I am wildly pleased. I prefer Google Maps, but Apple Maps has impressed me overall. I'm still looking forward to using GM when it finally arrives in iOS12 in the fall. But in NYC, Apple Maps is not too shabby. The key to me was the music integration. I have a Google Play Music subscription for my family. It's not voice activated for search in CarPlay like Apple Music is, but being able to get access to that music with ease in the car has been fantastic. There's a lot of room for improvement in CarPlay. Mostly I'd like to see them extend voice support to third-party applications. Let me use Google Search if I want. Let me search through Google Play Music. Siri is not useless, but it really is far behind. Overall, I was able to do all these thing when I had my phone on a mount with an aux cable for the music and Bluetooth for the phone. I loose a little bit in functionality, it's true, but this integration is miles better in both large and small ways. It's a fake screenshot they imposed on the video. Notice how he doesn't touch the screen and it changes to Waze. Sorry for the double-post on yours, but the 2018 Audi MMI interface is dramatically improved. Still not the greatest, but much better than before. Voice recognition works better for me than Siri does on navigation (could be my accent! ), and the new maps works better than Apple’s. I was and am quite surprised. Sirius has been supported by CarPlay forever - I use it all the time. The great thing about it is that you can stream at 3 different bitrates, all far superior to the highly compressed stream that a satellite connection provides. You have to have the streaming option as part of your subscription, but that's it - you can stream today, on iOS 11, and the sound quality is fantastic. I like the new functionality. The area I see for improvement is how it integrates with the vehicles infotainment system. Perhaps it already supports this and auto manufacturers just haven't integrated it. On another note, I have noticed that sometimes the nav doesn't announce turns soon enough, particularly on highways that have intersections (instead of ramps). That's too much. I've been renewing the 6-for-$30 "promotion" for years. With taxes and fees, that comes out to about $6 per month, but that's still too much for the limited selection and poor sound quality. The only reason I keep it is for the convenience of having background music. When I want selection and sound quality, I use Apple Music through CarPlay. Exactly this. Currently on a free 6 month trial. For music, there are MUCH BETTER choices (Spotify, Google) that I can stream, or even my own music. While it *seems* there are lots of genres, when it comes to the ones I want (contemporary Jazz) there is only one channel, and it's full of sleepytime music. So I use Sirius to listen to stations like CNN while driving, only to be annoyed every 5 minutes with 3 minutes of the worst radio commercials with people screaming their 800 number 5 times (like we have a hearing problem) and just plain useless commercials for obscure nobody companies I'd never call in the first place! Since I'm paying for Sirius, why do I have commercials at all? Did I mention losing signal if under an overpass for more than a few seconds? Annoying. Once my 6 months is up, it's gone. With regards to CarPlay, I hope they spruce it up and make it more rich/graphical with album art, etc. Anything left to car makers will never happen. Period. So if wireless Carplay is up to the car makers then I guess I'll have to buy a new car in 10 years. Pretty much the same. I have a GLI and the interface is much better than CarPlay. Especially with regards to displaying music. I get full artwork and all information about the song that’s playing as opposed to some fuzzed out graphics that CarPlay does. Plus us the fact that I use Waze for my long distance trips. Maybe when it’s allowed on CarPlay I’ll try it again. I use my Sirius solely for news. I am a news junkie. I own all of my music, and play it my car with a permanently connected (and regularly updated) 128GB iPod. This is good to know. I will go check their site right now. But it still doesn’t solve the problem of the other apps I mentioned. Add: I called Sirius. They will provide the service for CarPlay for an additional $5/mo. Ridiculous, and not worth it. I’ll stick with Audi’s MMI for now (which allows me use it for the $8.99 I pay), and therefore, continue to not use CarPlay. 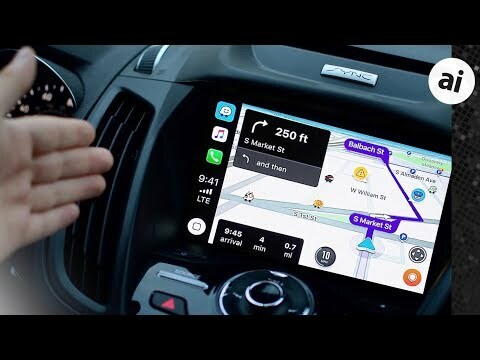 This is exactly the frustration I have with Apple vis-a-vis CarPlay, as I mentioned before: they really couldn’t be bothered to come up with a solution for their customers by negotiating some type of deal with a podunk little entertainment company, yet one that is available in most new cars that are sold!? Good to know. I’m just getting a Kenwood unit installed in my vehicle. I previously had a satellite kit installed and always hated the sound. You’re not a fan of those zyppah.com commercials? @Zroger73 - you can stream Sirius at 320kbps via CarPlay. Of course you need a reliable LTE connection for this, but that's not an issue for many/most people. I too have been doing the 6-for-$30 thing for ages. My gf has a streaming sub so I use her streaming credentials in the car when I want to stream. For stuff like baseball & football, the over-the-air broadcast is fine. I would take CarPlay supported map than Nav built into car. Now, phones have moved to Bluetooth 5, hope car manufacturers also move fast to update into car's infotainment system. "CarPlay: Wireless coming to Mini Australia, Honda adds to 2019 HR-V, more"
Good to hear about the Audi MMI interface. Wish they'd flash the firmware on mine! One nice thing with the interface - you don't have to switch the display to 'radio' to switch to a radio (or Sirius) station. You can simply press one of the preset buttons and it will switch to the radio while keeping the CarPlay display active. We then disagree. For what it delivered, I call that "dreadfully overpriced." YMMV. A highly personal choice. Highly concur on the sentiment about the car manufacturers needing better apps. The Ford app is ok. When it works. And it just really doesn't do much of value. Show me directions to the nearest dealer? Um...sure. Just what I need.